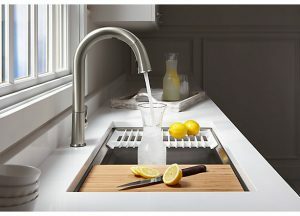 Home / UncategorizedWhat’s New: Kohler’s ‘Sensate’ Kitchen Faucet Supports Apple’s Home Kit Platform! The innovative faucet design can be turned on and off without any contact, and can dispense measured amounts of water, making it a helpful cooking companion. In addition to streamlining the time the user spends in the kitchen, the faucet allows them to track just how much they’ve consumed so that they can save on bills and benefit the environment at the same time. The Sensate is the first Kohler Konnect product to support Apple’s HomeKit platform, allowing it to be controlled by a variety of simple voice commands. Additionally, consumption and other information can all be tracked through the Kohler Konnect app. ← Marble Effect by MAS Paints!